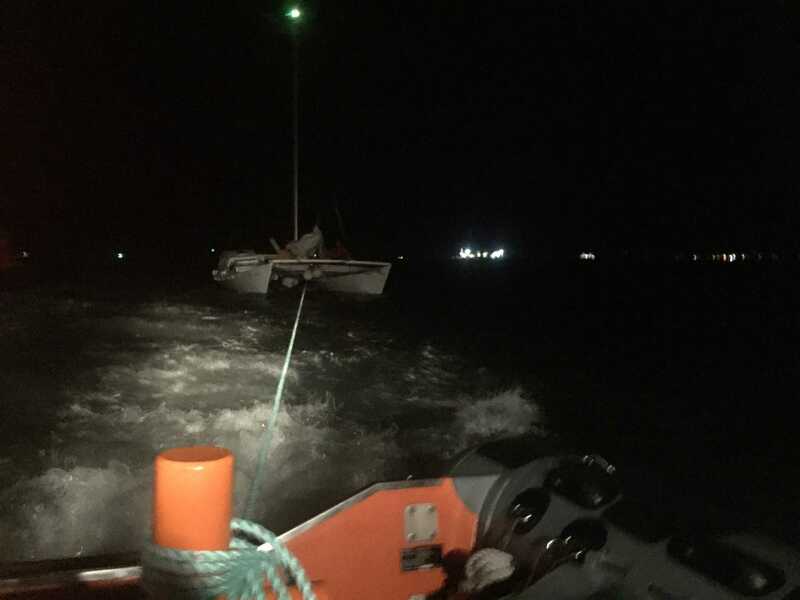 Gosport independent lifeboat was called to assist a stricken 31ft catamaran in The Solent on Thursday evening. UK Coastguard requested Gosport & Fareham Inshore Rescue Service’s lifeboat, the Joan Dora Fuller, take over a tow of a casualty vessel from Bembridge Lifeboat after it had got into difficulties off Ventor, Isle of Wight, at around 1930. GAFIRS rendezvoused with the RNLI launch at 2200 at Horse Sand Fort and took over the tow of the catamaran, which had only the skipper on board. The craft had left Dartmouth earlier that day and got into difficulties when its engine failed and a lack of wind left it dead in the water. It took around an hour to tow the vessel to Gosport Marina where she was safely brought alongside with the help of Hillhead Coastguard Rescue Team. The rescue was the 79th of 2016 for Gosport & Fareham Inshore Rescue Service.